Local Healthwatch have been around for just over two years – and have an increasingly positive story to tell. At Leeds Beckett University we have been working directly with local Healthwatch in Leeds and Wakefield and more recently with Healthwatch England developing Draft Quality Statements – which we are now helping trial. Earlier this year the Kings Fund produced a good report (Progress and Promise) based on a survey of local Healthwatch. In general terms this confirms our experience. Local Healthwatch are unique – they are the only organisation that has a helicopter view of an entire local Health and Wellbeing system. In the world of localism and integrated health and care this is key. The challenge that local Healthwatch face is matching this strategic leadership position with the resources they have at their disposal – which are very limited. This is compounded by the broad range of responsibilities that were placed upon them by the Health and Social Care Act. Some of these responsibilities are more important than others in helping local Healthwatch fulfil their responsibility to use public experience to drive service improvement. 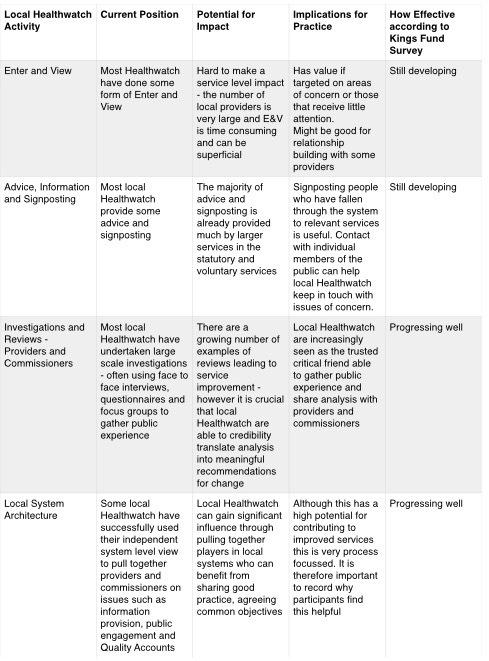 In the table below I give my opinion on the relative importance of four areas of local Healthwatch Activity and include the findings from the Kings Fund survey in the last column. 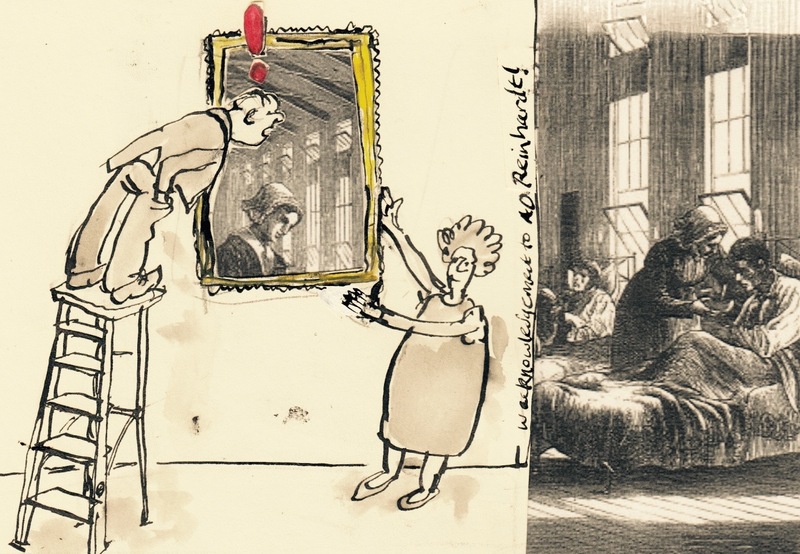 So, I think that while Enter and View and Advice and Signposting have some utility – the main opportunities for system impact rest with investigations and reviews and contributing to making the local system architecture work better. “we were struck by how many local Healthwatch cited producing a report as evidence of impact, without any evidence for commitment to actions or actions taken as a result …. this is understandable, but reports ultimately only have real value if listened to and acted upon”. We share this analysis we have worked with local Healthwatch supporting them develop capability on investigations and report writing. Our learning based on the experience of local Healthwatch is captured in the report ‘Local Healthwatch Investigations Briefing’ which provides a simple how to guide to conducting investigations that lead to change. We are supporting Healthwatch Leeds as they use their mandate to strengthen the focus of the local health and wellbeing system on the experience of the public. Healthwatch Leeds already chair a ‘Peoples Voice Group’ that pulls together officers responsible for engagement across the health and and wellbeing system in the city. This group meet approximately every 2 months – sharing good practice, agreeing joint approaches to producing engagement publicity and developing ways to co-ordinate a shared approach to building relationships with citizens in Leeds. I would support this – but go a bit further. Joint Commissioning – I think that Clinical Commissioning Groups need to be sitting down with local authorities to co-produce a forward commissioning plan – which they both resource. The logic here is clear – the direction of travel is towards integration and the two leading local commissioners need to take a shared approach – this is about engaging with the public in a coherent way across the health system. Independent Challenge – It seems increasingly clear that an effective local Healthwatch is best placed to bring an independent, evidence based challenge to key public health concerns on health inequalities, service access and effectiveness. If public health teams wish to make a substantial contribution to keeping these important items on the agenda they should be funding local Healthwatch to provide this analytical expertise. This is really interesting and hugely helpful to me as I have just been taken on the board of my local Healthwatch here in Tower Hamlets. Based on my experience in Yorks and Humber, and particularly in Leeds, I agree with you about local Healthwatch growing in influence and gaining increasing recognition within the health and social care system. After a shaky start it’s been great to see Healthwatch Leeds really find it’s feet in the past year. I’m especially pleased to see them, along with many other local Healthwatch, take a particular interest in primary and social care and using innovative ways of reaching out to people who might not normally get involved – for example young people who Leeds and Wakefield, Healthwatch are successfully engaging. Health Together, Leeds Beckett University.